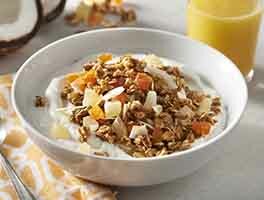 What a pleasure, to start your day with a tummy-filling bowl of delicious whole-grain granola! And it's easy to make your own. Just stir together everything but the dried fruit, and bake until crunchy. Add your favorite fruits once it's cool. 1 hrs 20 mins. to 1 hrs 40 mins. 1 hrs 30 mins. to 1 hrs 55 mins. Preheat the oven to 250°F. Lightly grease two large rimmed baking sheets; or line them with parchment. In a very large bowl, combine the oats, coconut, wheat germ, nuts, and seeds. Mix well. In a separate bowl, whisk together the oil, salt, maple syrup, and vanilla. Pour the wet ingredients over the dry mixture in the bowl, stirring and tossing until everything is very well combined. Spread the granola on the baking sheets, patting it gently to flatten. 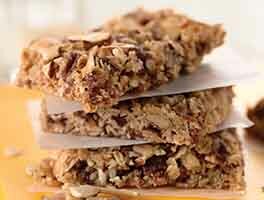 Bake the granola for about 90 minutes, stirring the mixture with a heatproof spatula every 15 minutes or so. You want to bring the granola at the edge in towards the middle, so it all browns evenly. Reverse the baking sheets in the oven (top to bottom, bottom to top) each time you stir. 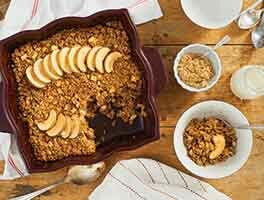 When the granola is a medium golden brown, remove it from the oven and cool completely on the pans. Transfer the granola to a large bowl, and mix in the dried fruit. 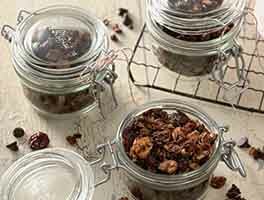 Store the granola in a tightly closed container at room temperature for several weeks; freeze for extended storage. Or portion into pretty patterned plastic bags for gift-giving. Yield: about 18 cups, about 4 1/4 pounds granola. Pure maple syrup (as opposed to maple-flavored cane sugar syrup) makes a MUCH tastier granola. If you use "fake" syrup, be advised you'll have to use a lot more to get the same degree of sweetness; probably an additional 1/2 cup. Our Fruitcake Fruit Blend, 20 ounces of tasty raisins, currants, pineapple, dates, and cranberries, is the perfect size for this recipe. Jammy Bits, sweet, soft little morsels of fruit purée, step in nicely for any type of dried fruit. Try raspberry, blueberry, strawberry, peach, orange, or apricot. Try this a tasty (and healthy) breakfast treat: layer thick, Greek-style yogurt with granola and fresh fruit to make granola parfaits. I've tried many granola recipes but this one is our favorite. My family loves it with yogurt and fresh fruit. It's also a handy snack to take when on the go. During planting and harvest seasons I pack it in lunches in snack bags. Lining the jellyroll pan with a sheet of parchment paper makes for much easier clean-up after baking. This has not affected the baking time. I have used both maple syrup and honey when making this recipe. Both work very well but my family prefers the flavor of honey. I also add 1 Tbsp. cinnamon. Thank you King Arthur for reliable recipes and great products!! Got so tired of not finding a granola any where that had the ingredients I wanted or the ones I didn't want. So glad I tried this recipe! Made a 1/2 recipe for starters and also some changes--used KA oat bran instead of wheat germ and raw pumpkin seeds instead of sunflower seeds. For the last 10 min. of baking I added some puffed brown rice. My husband doesn't eat granola and he likes it! Thanks KA! I am not a huge fan of maple flavor (no judgement, please), so I substitute 1/2 cup of honey instead. I use 1 tablespoon of your Chai Spice mix too and always, always get rave results! Thanks so much!! Great every time I've made it! I use coconut oil (99g) and honey (anywhere from 260-300g; 300 was too sweet!) and it always turns out well. If you reduce the amount of sugar you use, remember to adjust the salt accordingly! This recipe is extremely versatile and you can mix and match whatever add-ins you have on hand. I never include the wheat germ simply because I don't have it. I would recommend using untoasted nuts simply because 90 minutes in the oven will toast them. Also out of pure laziness I always make the entire recipe on one sheet pan with some careful stirring. This is so good! I only made a half batch and it is still a lot. I asked the bakers helpline for a substitute for the wheat germ to make it gluten free. They recommended oat bran and that worked well. My mom made this granola for a breakfast potluck at her office, and brought all the toppings (fruit, nuts, chocolate chips, etc) to make a "granola bar". Her coworkers loved it! Really great. Do add coconut flakes, they add a wonderful crunch and toasty flavor. I use a little less maple syrup and have substituted pumpkin seeds for sliced almonds. Tasty both ways! Absolutely love this recipe and make it year round. Makes a great homemade gift too! I do not include the wheat germ. I substitute coconut out for the vegetable oil. I do half maple syrup and half honey. And lastly I use 2 cups of pecans rather than 1 cup. Use it as a topper for my bowl of homemade yogurt practically every morning. Delicious! The ratios here are perfect. 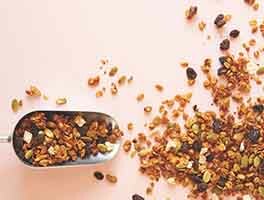 Some tips from having made it over and over: - If you want a "clumpy" granola, one with clusters, you can add a couple tablespoons of your favorite flour (we use spelt) and sprinkle in some water. It will help things to stick together. - The baking temperature for this recipe is too low for my tastes. It takes much longer than the 90 minutes listed in the recipe. I've got a batch in the oven right now and have it at 325 - I just have to make sure to stir it frequently (every 15 minutes early on, every 5-10 minutes later as it starts to dry and the risk of scorching goes up). Higher temperature means that it can get a little bit toasted, and also that it dries out much more quickly. I made this with craisins and dried, unsweetened strawberries. It was easy to make as a half-batch. Not an issue as this is how the recipe is written, but I really don't like maple syrup and there was a strong taste. I realize it would be more sticky and harder, but I may try it with brown rice syrup next time.